Did Party Politics trump Democracy at the Georgetown City Council? Even before the dust had settled as the Georgetown Municipality elected it’s Mayor and Deputy Mayor along with members of the Finance Committee, some persons had questioning looks on their as to what transpired during the election of those persons. Newly Elected Mayor Patricia Chase-Green and Deputy Mayor Sherod Duncan were elected to their posts unopposed. However, it was not the same for the members of the Finance Committee. Councilor Malcolm Ferreira opposed the election of five of the members of that Committee throwing his support behind his colleague Carolyn Caesar-Murray. This was after Murray was nominated to the committee by Team Benschop’s Salima Bacchus-Hinds. As the votes for the five members were called, Ferreira raised his hand each time but to no avail as they would later be elected Councilors with the full support of other APNU+AFC Councilors on the Council. The Finance Committee members are Oscar Clarke, Junior Garrett, Yvonne Ferguson, Ivelaw Henry, Alfred Mentore, Sophia Whyte and Linda-Gomes Haley. After the process was over and the Finance Committee was finalized, Ferreira said that it was worth the shot. “My colleague and fellow Councilor was nominated and I seconded it so…it seemed like mission impossible but I had to vote the way I voted so she could stand a chance,” he stated. The popular entertainer said the APNU+AFC has a deciding vote on the Council and they chose to use it in the manner they saw fit. “If you would have observed that people – someone even rose to nominate someone who wasn’t present. So it was a structure,” said Ferreira. Her colleague, Michael Leonard affirmed that the actions of the councilors essential trumped democracy.“We must demonstrate inclusion, we must demonstrate that we want bi-partisanship – not just say it. We had an opportunity for inclusive democracy but we are not seeing that,” said Leonard. APNU+AFC Councilor Akeem Peter, however, does not believe that what transpired was a display of Party politics but rather putting in place what is best for the Municipality. “I don’t think its an issue of party politics, the APNU is a compilation of 6 Parties so it’s a compilation of six party ideologies….I do believe persons chose along the line that is right; the line that is formally suited to guide Georgetown,” said Green. 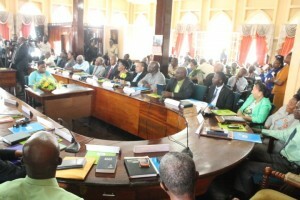 In the wake of voting strictly along party lines at the inaugural meeting of the Georgetown City Council, veteran People’s National Congress Reform (PNCR) politician, Oscar Clarke plans to explore the involvement of other parties especially the PPPC in other committees before they are elected. “I think that in the other sub-committees that are going to be held , I am going to insist with the Mayor that all the parties and groups get representation on the sub-committees,” he said. The two other statutory committees are on Works and Social Development, in addition to seven other committees. Clarke it was not possible for councillors to negotiate the membership for the Finance Committee because election for that body was held immediately after the councillors were sworn in and mayor and deputy mayor elected. He questioned why councillors representing PPPC, Team Legacy, and Team Benschop did not nominate other persons. “I am saying the more nominations that you make, votes might be split.” The PPPC Councillor abstained from voting for members of the Finance Committee.